Japanese GP F1 Strategy Report Podcast – our host Michael Lamonato is joined by Abhishek Takle – F1 journalist. Nico Rosberg cemented his lead in the drivers’ championship with a dominant victory at the Japanese Grand Prix, but behind there were plenty of frenetic battles and tense fights over the remaining 21 places. 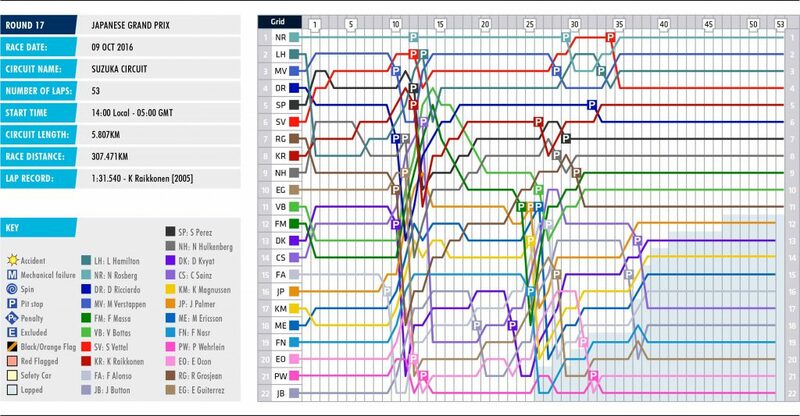 For only the seventh time in F1 history, all of the drivers made it to the chequered flag. As always at Suzuka, the racing was exciting and there was a decent amount of strategy to keep an eye on too. Max Verstappen finished in second place, with Lewis Hamilton in third. 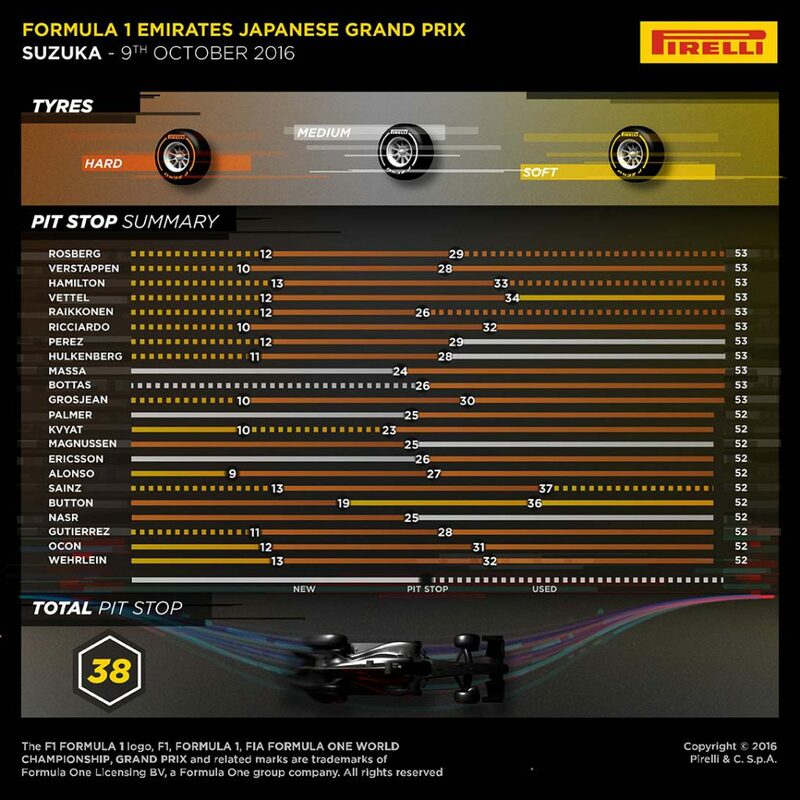 The vast majority of the F1 grid completed a two-stop strategy at Suzuka, as predicted by Pirelli before the race. Bringing the hard, soft and medium tyres and the cooler temperatures in the race meant each compound lasted a decent amount of time, so wear and degradation wasn’t a major issue. We did hear a few radio messages during the race of drivers losing temperature in their tyres and struggling a little with wear, but the Pirelli compounds largely held up well. It could be argued the tyre supplier should’ve gone a step up to create more strategy options and produce quicker lap times. A season or two ago it was rare for all three tyre compounds to be used for the first stint of a race, but this has proved to be the case several times in 2016 so far. It’s probably in part due to the smaller gap between the compounds and also the closer pack in general, meaning teams are willing to take a risk to try and make a difference. Jenson Button, Felipe Nasr and Kevin Magnussen all started on the hard tyre. Button had a poor start and that hampered his running on the tyre but the others proved to be fairly competitive against those on the other compounds. Nasr and Magnussen each did 25 laps on their tyres, while Button only did 15. Felipe Massa, Valtteri Bottas, Jolyon Palmer and Marcus Ericsson all lined up on the mediums. This enabled them all to stay out longer and move up the field while others pitted, but they then lost time as those who had already stopped made a move back up the order. Massa managed 24 laps, while Bottas was on used mediums and completed 26. Hamilton had a disastrous start and dropped from second to eighth on the opening lap, in part blaming himself and also a slightly damp inside line on the grid from earlier rain. Mercedes had already locked him into a soft tyre first stint, but the soft compound eventually helped him make up ground with the Mercedes’ superior pace. None of the top six used the medium tyre, with Hamilton pitting later than the rest to go onto the hard tyre. It worked and he made up a few places with the stop, with another set on the stable yet speedy hard compound putting him in contention for a podium. 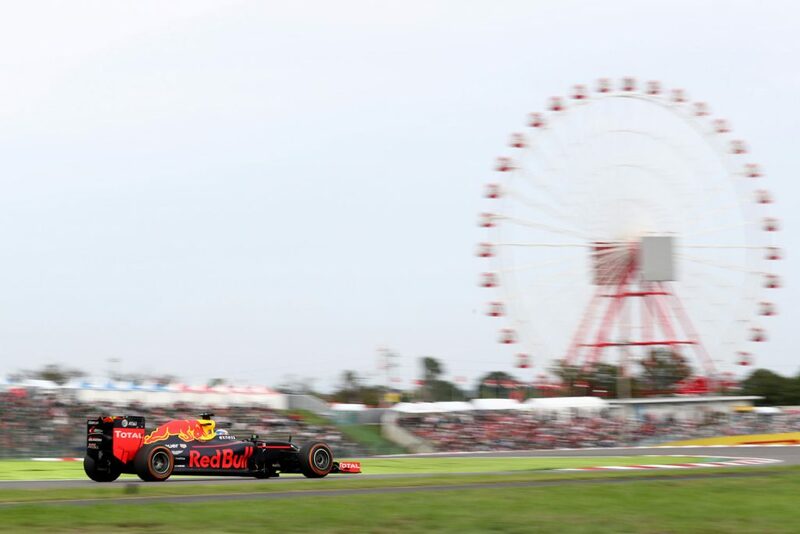 He then used the Mercedes’ better race pace compared to the Red Bull to close on Verstappen but the Dutch driver’s aggressive defence caused him to go straight on at the final chicane with a few laps to go and he had to settle for third. There were a few teams going for an alternative route with strategy. Two stops was the safe bet but the tyres performed so well, some were able to pit just once. There were also few incidents on track, which helped make this a relatively straight-forward strategic race (which is good, in a way, but we’d have liked to see a more varied amount of strategy). Massa and Bottas both used one stop, going from the mediums to the hard tyre, to move into the top 10 after disappointing qualifying sessions and first laps. Mid-race, it looked like the team was in for a tough and point-less race but they clawed it back with long stints on the hard tyre to end the race. Ericsson also used this strategy to good effect, while Magnussen and Nasr stopped once, but with starting on the hard tyre and ending on the mediums. It didn’t work quite as well, maybe due to the more rubbered-in and warmer track towards the end of the race. 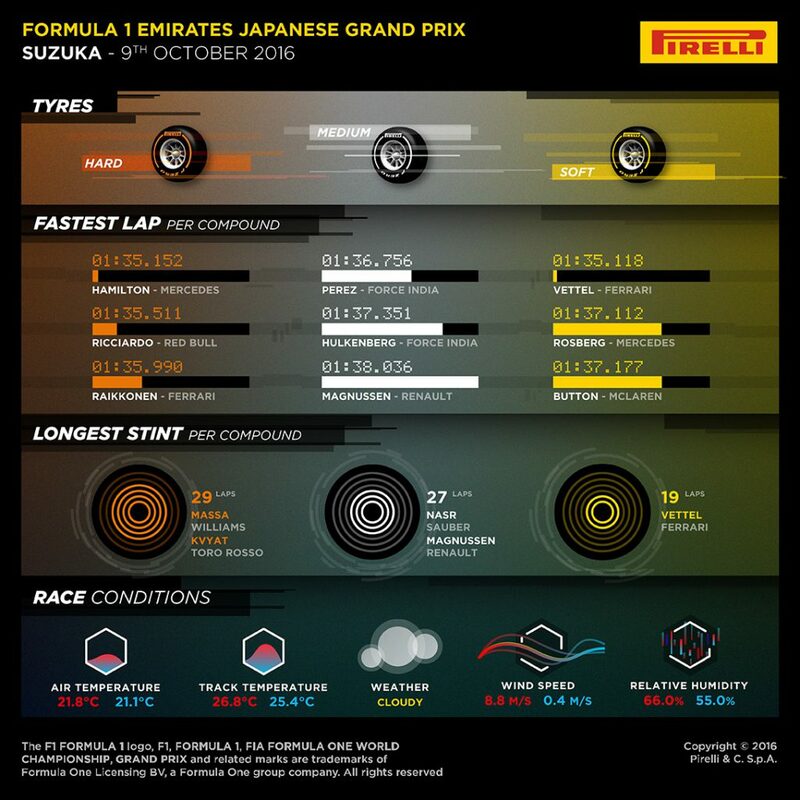 Unusually, it looked like the hard compound tyre was the one to go for during the race, but a few drivers tried to use the soft tyre’s quicker pace and faster wear to make up ground. Sebastian Vettel and Jenson Button both spent two stints on the softest of the three compounds. For Vettel, he made most of his progress in the early stint, using the faster speed of the Ferrari to move through the midfield runners after his penalty. His team-mate Kimi Raikkonen did the same, albeit at a slightly slower rate. He was holding third after the first stop but lost out to Hamilton with his second trip to the pits, but a new set of softs right to the end did help him keep hold of fourth. Button two stints on the soft to end the race and it moved him up a few positions with a more aggressive strategy but he’d lost so much time in the first stint and start, it only got him to 18th.